In Trim is located on Ridgeway Road. We're right opposite the Asda supermarket! You'll find it at the rear of the club. The entrance to reception is at the front on Ridgeway Road. 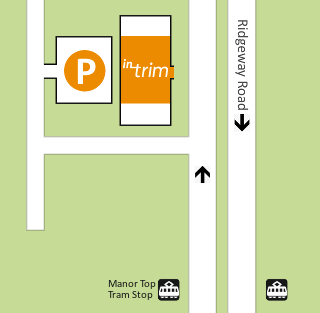 You'll find us right by the Manor Top tram stop. If you ever find yourself 60 miles south down the M1, then look up our sister club in Leicester: The Fitness Bank.